This book is written for first-time FEA users (in general) and MECHANICA users (in particular). After a brief introduction to finite element modeling, the tutorial introduces the major concepts behind the use of Pro/MECHANICA to perform Finite Element Analysis of parts. These include: modes of operation, element types, design studies (analysis, sensitivity studies, organization), and the major steps for setting up a model (materials, loads, constraints, analysis type), studying convergence of the solution, and viewing the results. Both 2D and 3D problems are treated. 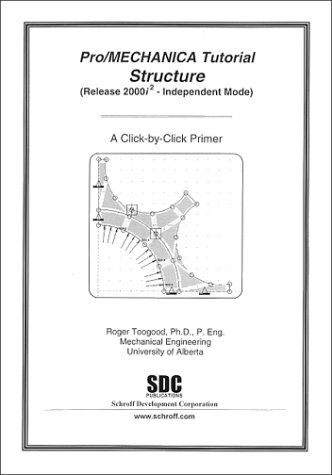 The tutorial uses a click-by-click format to show the command sequence exactly as performed by the user for a wide variety of models and design studies.